PALM BAY, Florida - The 2017 Health First Palm Bay Hospital Holiday Light Parade, presented by the City of Palm Bay, is scheduled for Saturday, December 2 at 6:30 pm. 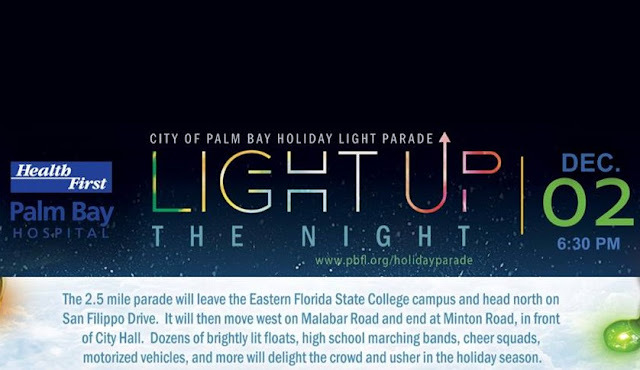 This year’s theme is “Light up the Night in Palm Bay Holiday Spirit”. Organizers say that they are looking for lots of lights this year. Thousands of spectators will line the 2.5-mile parade route which will leave the Palm Bay Campus of Eastern Florida State College and turn north on to San Filippo Drive and then turn west on to Malabar Road. The parade will end in front of City Hall at Minton Road. Brevard County’s premiere holiday parade will feature over 80 entries, delighting the crowd and ushering in the holiday season. New this year, beginning at 5:00 p.m., Malabar Road will be completely closed, in both directions, from San Filippo Drive to Minton, and Minton Road will be closed between Malabar and Jupiter Boulevard. The estimated time of the parade ending is 9:30 p.m. The roads will re-open as soon as barriers and pedestrians are cleared from the roadway. All traffic exiting Interstate 95, both Southbound and Northbound, will be directed East on Malabar Road. Motorists are asked to use Palm Bay Road or Babcock Street as an alternate route during the parade. The advantage of the new traffic pattern this year is that Malabar Road will shut down later and re-open sooner. There will also be additional safe viewing areas for the public in the median of Malabar Road.